As a frequent user of Twitter and a follower of more than 300 users, I know what it’s like to get constantly bombarded with new tweets. In fact, there are some days that I really regret having some tweets sent to my phone as texts–too many times have my coworkers been assaulted by my juvenile ringtone. Seeing that indicator bar pop up at the top to inform me that I have unread tweets incites a Pavlovian refresh reaction. Be paranoid no more, Twitter nation. Caleb Thorson has created Trickle, a passive Twitter client. Simply log in with your pertinent information and voilà! Your news feed will begin streaming across the screen, one tweet at a time. New tweets will fly in from the right, and you can read old tweets by swiping across the screen. Trickle can be used in any position if the Rotation function is toggled, but it works best while connected to a dock, as it does not allow the device to sleep. After a period of inactivity, the app will return to the latest tweet. You can set up everything (refresh time, button style, etc.) in Settings: just tap the screen to reveal the info button. Trickle is not a full-service Twitter client, however. 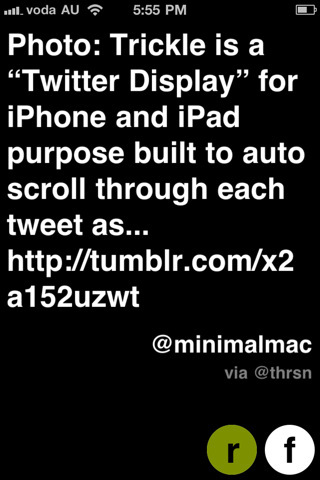 From the display pages, you can only Retweet and Favorite individual tweets (tap and hold the bottom buttons). You can’t tweet, view pictures, or open up links that appear in tweets. So if you’re a fairly interactive Twitter user, Trickle probably isn’t for you. But as an unobtrusive tool–it doesn’t beep to notify you of new tweets–Trickle is unquestionably awesome. Its pared-down functionality is also mirrored in the design: white Helvetica text on black background. Minimalism at its finest, ladies and gents. 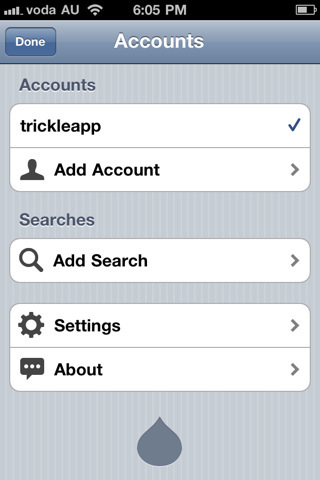 AppSafari review of Trickle was written by Julie Guan on January 16th, 2011 and categorized under App Store, Featured, iPad apps, Social, Universal. Page viewed 3653 times, 1 so far today. Need help on using these apps? Please read the Help Page.